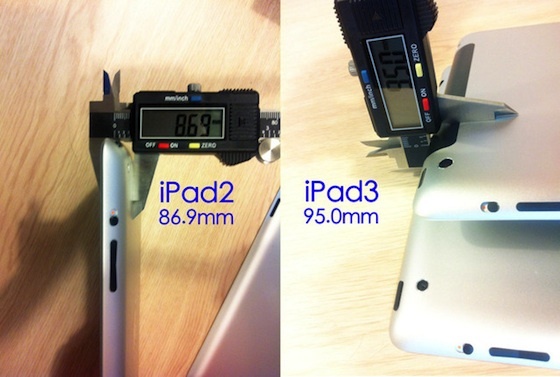 New photos have emerged via Apple.pro that show a direct digital-caliper comparison between the thickness of the outer shell casing of the iPad 3 and iPad 2. Perhaps unexpectedly, the iPad 3 has been shown to be marginally thicker than its predecessor by 0.81 mm. Rumors that the iPad 3 would need to be thicker than the iPad 2 in order to support the new high resolution display first surfaced several months ago, but were largely ignored with Apple consistently delivering faster, lighter and thinner devices with every refresh. Original speculation pointed to a dual-bar lighting system that would be needed to support the retina display as the reason for the extra depth necessary but this can’t be confirmed until a full teardown becomes available on launch day. The iPad 3 is still far thinner than the original iPad, which had a thickness of 13.4 mm and it has been suggested that the roughly 9% increase in thickness from the iPad 2 will be unnoticeable.